Everyone this world loves creation but everyone cannot be a designer. Every day we think that how we are going to shape our lives and how it will influence the crowd around us. The power of creation and influencing people makes a person, Designer. One of the most important parts of designing. It alters with the moods of the people. The three main properties are value, hue and intensity. It is created by moving pointed tool. It can be created simply or as the designer chooses. Space is the illustration of depth in the artwork. For eg.2-D, 3-D, positive. It is the feel of the surface quality. It can be created either naturally or by art. The amount of lightness and darkness in the design. It is the length, width and the height. It can be viewed from different angles. It is the geometrical and the organic shapes, which are used in a design. When the visual weight on either side is created in perfect symmetry, it creates a well-balanced design. It is one of the basic principles of good designing. When certain elements stand out to create a purposeful focal point, then it is called Emphasis. In a design, a pattern is created using demonstrated repetition, which again, is one of the important principles of good design. Everything in the design should be in correct proportion. Eyes have the tendency to move through the composition, which refers to the rhythm of the design. If one works on this principle, it creates an illusion of movement in the art. The elements should be arranged in such a way that all the parts refer to what actually is the principle of unity. Some businessperson still does not know the value and importance of a perfectly designed website. A professional web presence can help you to stay competitive in the market. One should always save some extra pounds for getting a website designed especially for small businesses. 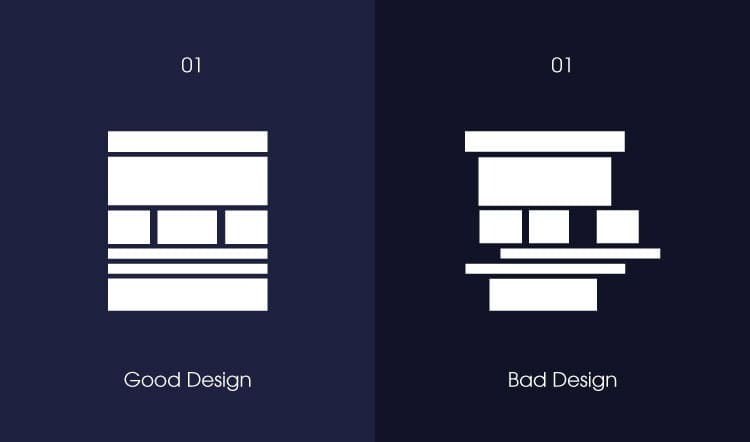 Bad designing does not have a specific definition. Using too good elements at wrong places suffers the problem of 'Brilliant ideas but bad execution'. There are many websites suffering from this problem. Too over-crowded websites do not only look unprofessional but it is even displeasing to the viewer's eyes. People will often bounce off your website. The blogs of the company are not fluent and updated. Updating one blog in one month says that you are not trying enough. Irrelevant content is too bad. It has nothing to do with the company and the services. The blog should be something valuable and it should be not about the last trip you had. Too much content is bad.It leads to a negative and unprofessional image of the company. If you are a professional businessperson but your website is funky and childish, you are portraying a bad image. Non-relevant stuff can lose you, customers. If your customer does not get what he wants from your website, he will not come back to your website. But what happens when he gets the relevant things on your competitor's website? Insult to injury. A website not updated frequently will keep way behind in the technological times, and there will be a negative image that you do not care enough to stay updated.